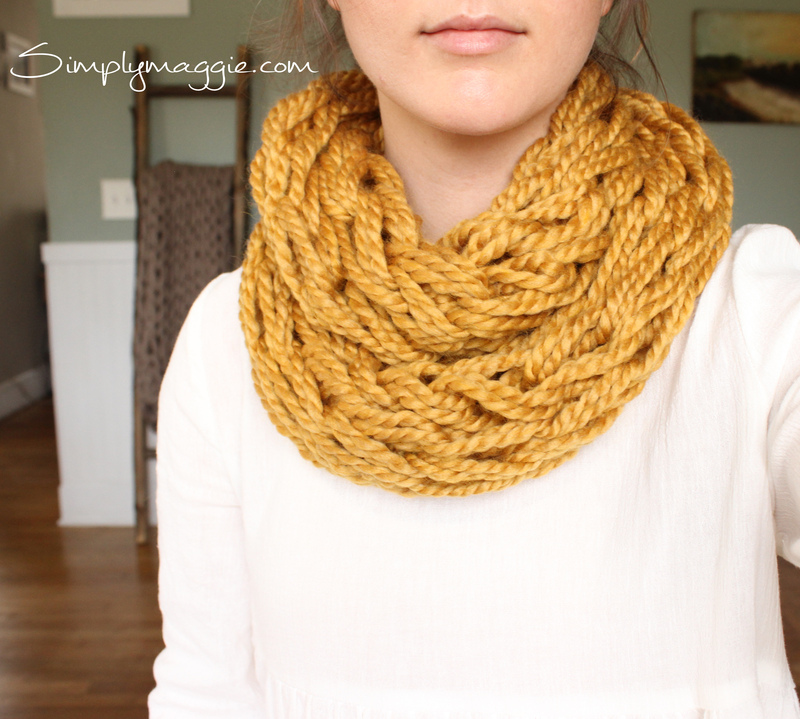 A lot of you have asked me for a pattern for this cute addition to the arm knit scarf. So here you go. I have created four different cuff patterns. One including a button hole . If you don’t know how to knit a button hole then try one of the patterns that you permanently attach to your scarf for now. 1 skein of Lion Brand Wool Ease Thick and Quick yarn in the color Linen. 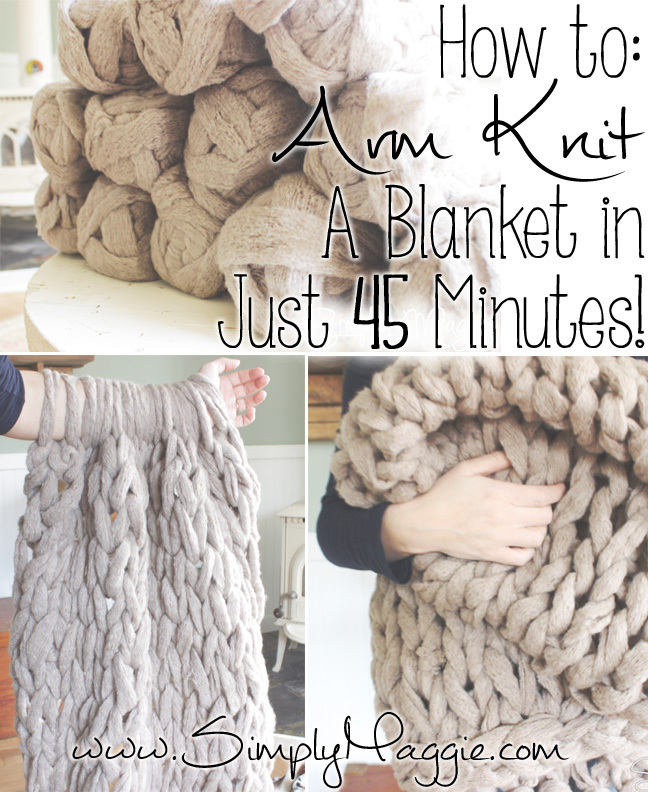 2 Skeins if you’ll be arm knitting the scarf as well. Sewing needle and thread if you get a button with small holes. The first one (#1) (Left) is purl stitch with no button hole. The second one (#2) is crochet with no button hole. The third one (#3) is purl stitch with a button hole for removal. The fourth one (#4) is garter stitch with no button hole. 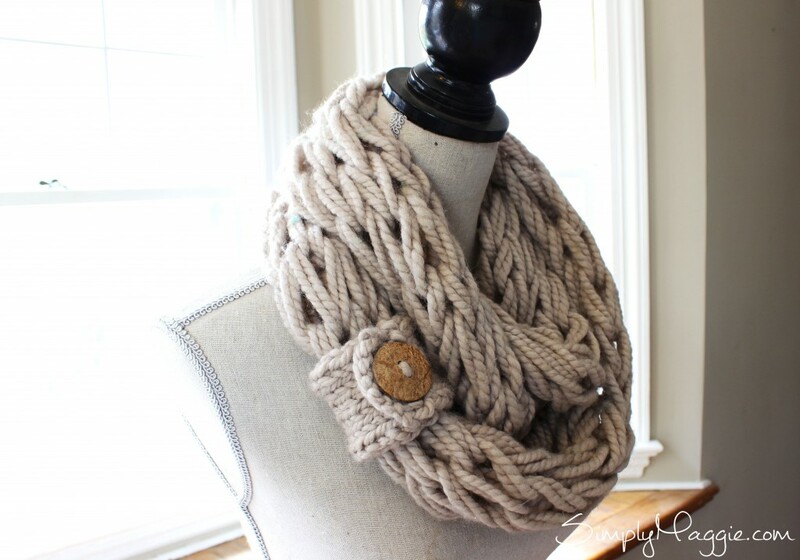 Here is the scarf featuring the purl stitch cuff with the button hole for removal. 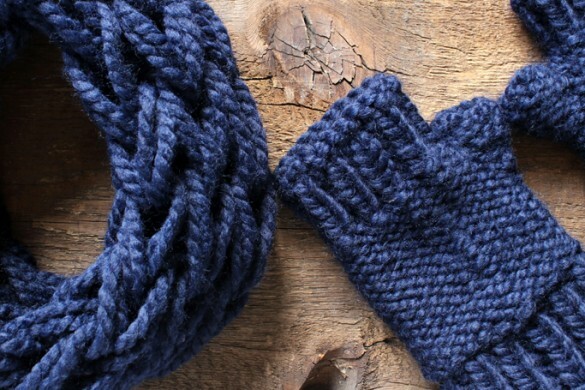 These sure are stylish, and make a nice addition to an arm knit scarf. Thank you for sharing these patterns. 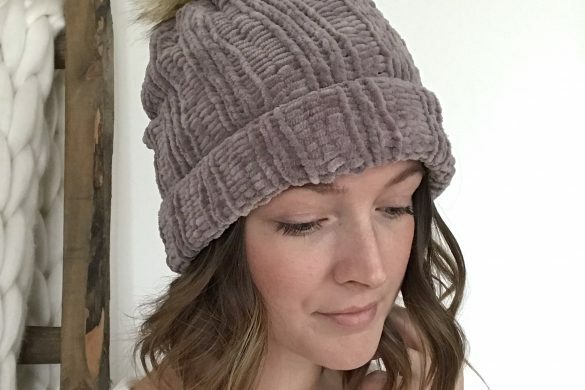 I wish I knew how to knit! 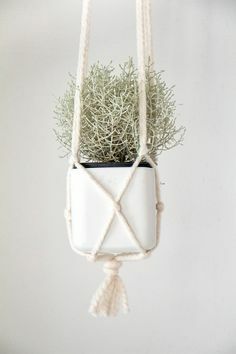 This would look awesome as a bracelet too! 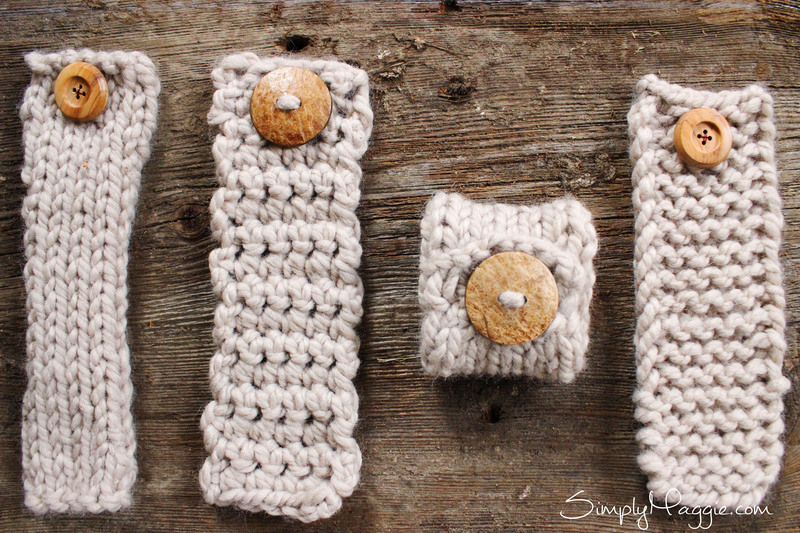 Where would I find your pattern for the infinity scarf that matches these 4 button cuffs please? thank you. How do you make the button hole for removal in option #3? 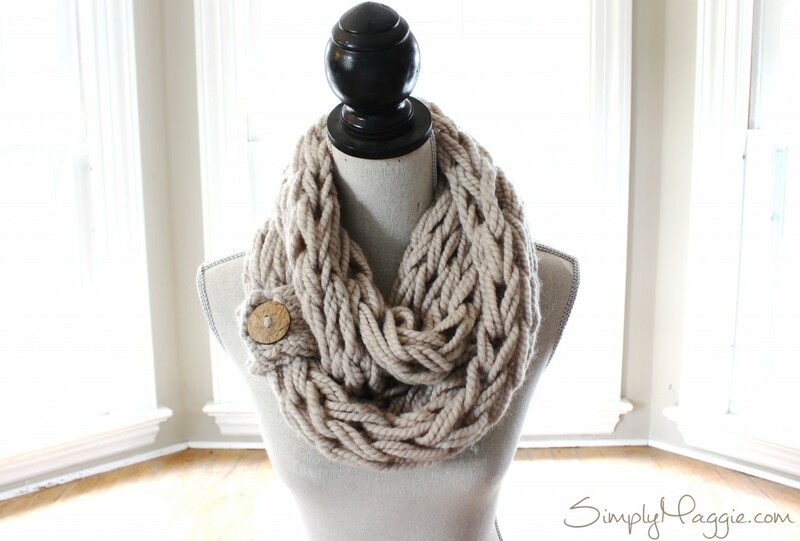 Simply put one hand in each end of the scarf and pull tight until all stitches are back to their original size. 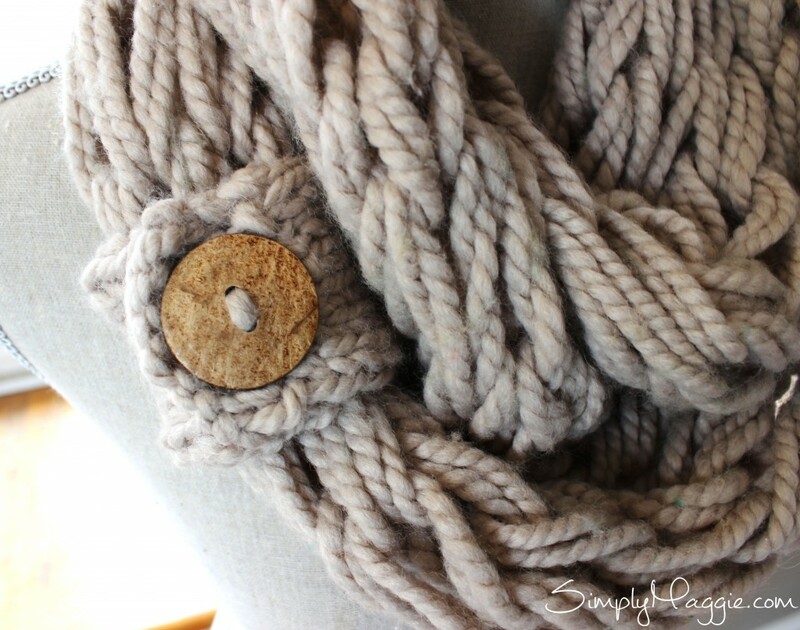 It appears that the scarf is two layers and the button is attached to only one “loop.” How is this done? 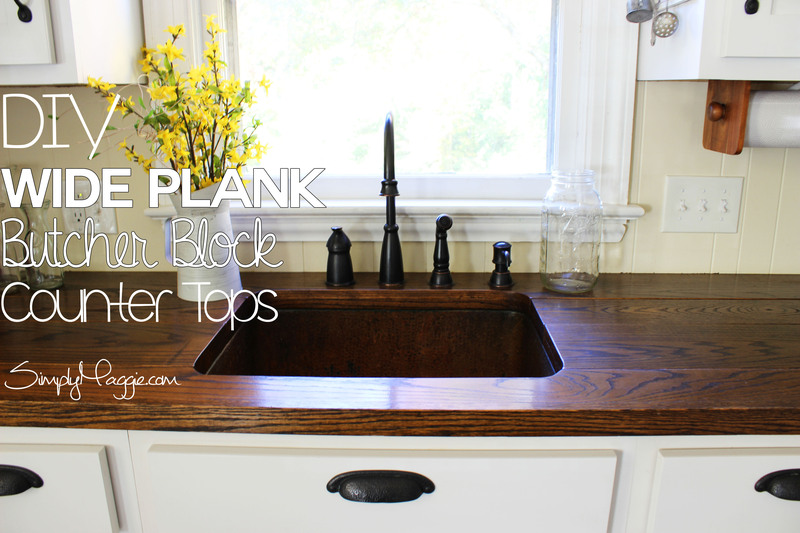 Hello from Premier Yarns! 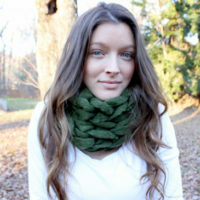 We’ve had the pleasure of viewing your awesome cowl and blanket using our Couture Jazz yarn. We would like to speak with you! Please contact us at the information below, or you may wish to provide a phone number or email for us to reach you; which ever is best for you. I’m making the 3rd one (the one with the buttonhole) in stockinette like the pattern says. 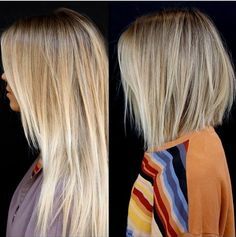 What do you recommend to keep the edges from curling. 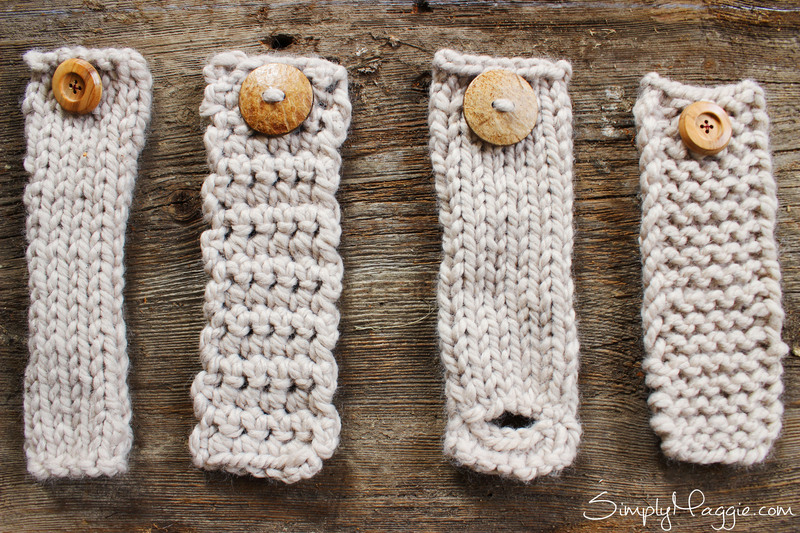 The button cuffs are a nice finish for the arm knit scarf.What size needle did you use for the knitted button cuffs and what size hook for the crochet button cuff? Thanks for the great tutorial! I made the button hole one last night according to your video, and after making the button hole and purling the next row..I ended up with 9 stitches instead of 8. I figured I did something wrong somewhere, so I just tried to start another cuff, and it happened again! I’m brand new to knitting, so maybe this is supposed to happen? I have no idea where I’ve gone wrong if not :). Thanks for any tips! Hi there. Try counting your stitches while making the button hole to find where you are making a mistake. Also make sure you’re binding off that one extra stitch when ending the button hole row. Thank you Maggie! I figured it out. Somehow, after making the button hole, and then going to purl the very first row…when I purl the very first stitch, I am making two stitches. I guess that first stitch is more tricky than the rest. Took me awhile, but I think I got it :). Appreciate your time and your videos! Thank you SOOOOOOO much for your videos!! I made arm knit scarves for all my friends and sisters for Christmas this year! Everyone loved them!!! I would like to try the cuff now. 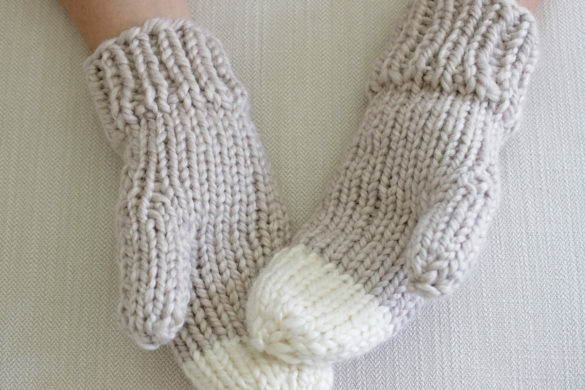 Is there any possible way to make the cuff by finger knitting? I figured if anyone could do it YOU could!!!! 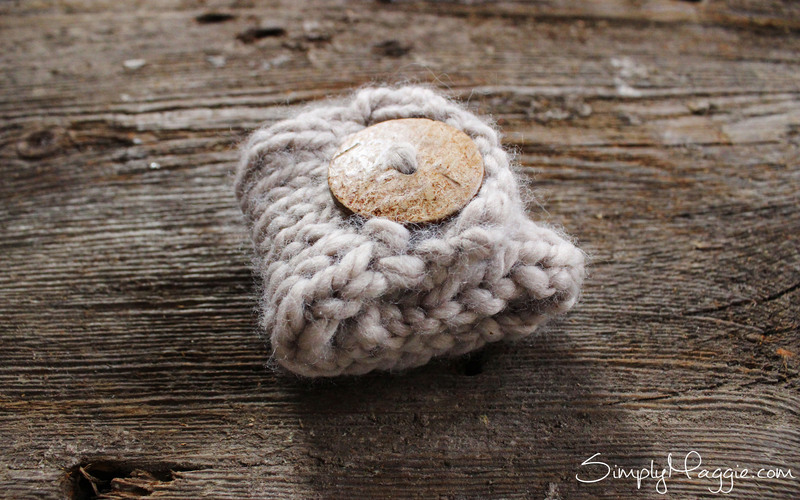 If you figure out how to finger knit a cuff, please, please, please post a video!!! You are AWESOME and amazing!! Love this pattern! How do you keep the cuff with button hole to not curl? Both sides keep curling under on me.Thanks! 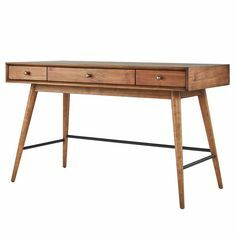 What are the button sizes please? 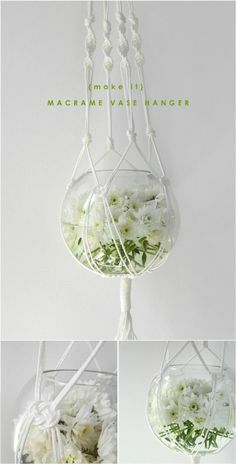 I want to make these bands on a loom, will the pattern be the same. If it’s different can you post the pattern. i would liked to see about making this a little wider for #3 how would that work for the button hole i was thinking either 10 stitches or maybe even 12 stitches?